Die Co. flat nuts come in 25 standard formats – the most commonly requested sizes and designs or they can be customized for a specific application. 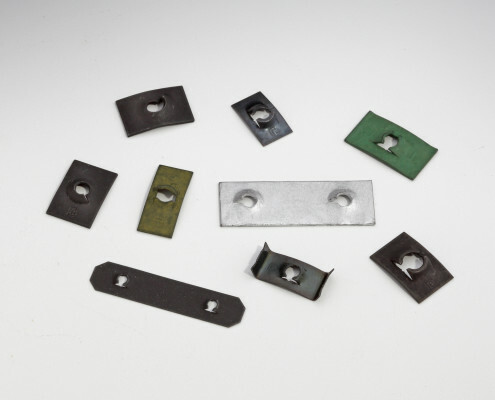 All of our flat nuts are made from spring steel and will not loosen due to vibration. Their self-locking design makes them easy to install and remove without special tools. And they are lower cost than most alternative fasteners. Flat nuts are a good option when physical space is limited. Browse the selection of Die Co. flat nuts in our product catalog, contact us to customize a flat nut for your application or check for a competitor part on our cross reference list. Learn more about Die Co. flat nuts and find part numbers in our product catalog or check for a competitor part on our cross reference list. Request a quote now – or call 440-942-8856 to speak with a Die Co. representative. Email a Die Co. representative – or call 440-942-8856 – and tell us what you need. One of our fastener experts can help you find or design the best flat nut for your application. We look forward to helping you get the spring steel fasteners you need, on time, every time.